I mean let’s be honest, shall we? 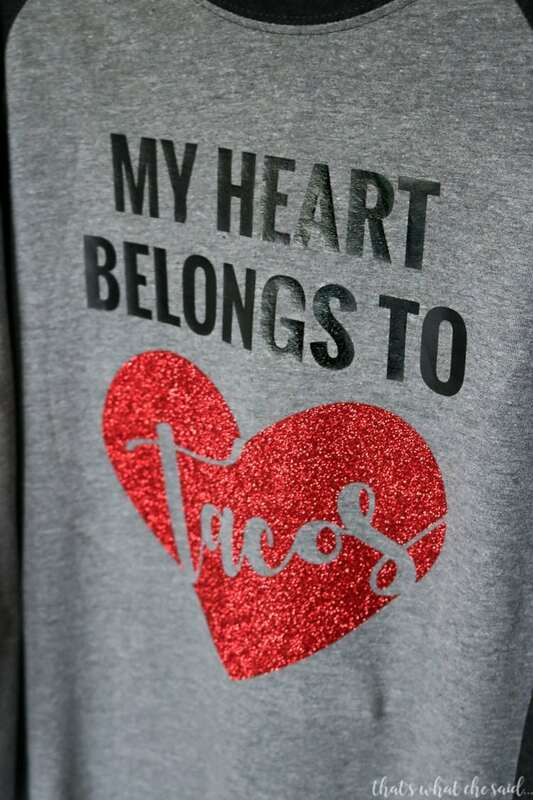 My Heart Belongs to Tacos and I bet yours does too! Grab this SVG file to make your own shirt, hat, coffee mug, tote or more using your Cricut! The perfect Valentine’s Shirt Idea! Do you have a Cricut cutting machine? If so, I hope you will check out my Getting Started With Your Cricut Explore post. This shirt was a breeze to make and I even upped the fun factor by using Glitter Vinyl! Any excuse to use glitter vinyl right? 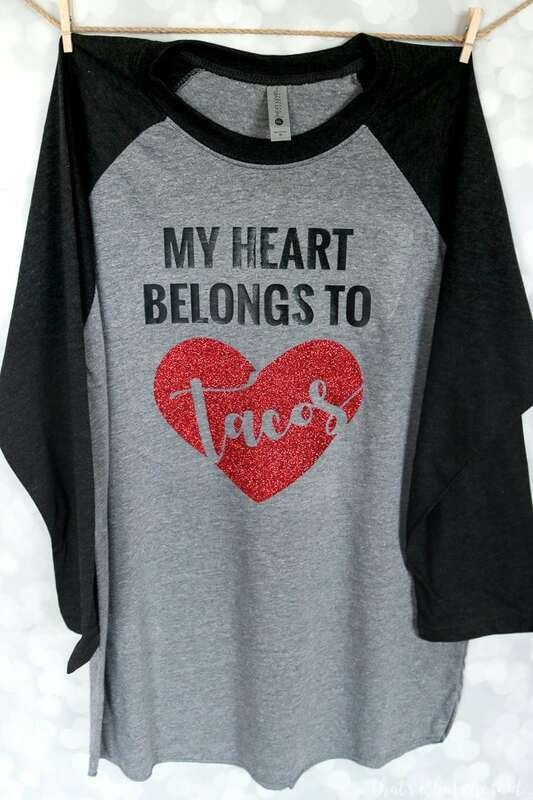 Pair this with some comfy jeans, converse and you are set for Valentine’s Day…and for tacos! Learn how to cut Iron On with your Cricut and you can find detailed instructions on how to apply heat transfer vinyl here. Cutting with a Silhouette you can check this page out. Don’t forget! When you are working with Heat Transfer Vinyl you HAVE to Mirror your Design or your finished project will be backwards! I seem to forget this so learn from my mistakes and wasted HTV! I cut the heat transfer using my Cricut Explore Air and then I applied to my shirt using my iron. The Easy Press is awesome for Shirts! Add that to your list if you don’t already have one! I definitely have it on my list! This file is no longer available as a Flash Freebie. You may now find it in my shop. Be sure to sign up for my emails to be alerted for all future flash freebie files! I needed to make this for tonight. Just came from a Taco tuesday night at a friends house. Too cute.